Given a nice big lot, spectacular situation, mature trees, an architect-designed mansion, and massive infusions of money, it's practically a no-brainer that there will be a beautiful garden, or even a merely adequate or maybe just a functional one adorning it all. 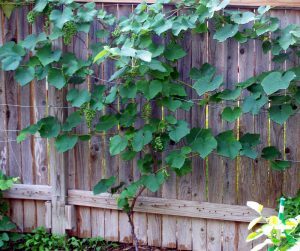 What is really a challenge for a hard-core gardener is to create a lovely garden on a tiny lot, in a fairly ordinary suburb of small and relatively plain houses ... and on a budget. Sounds impossible, but it has been done by at least three homeowners in my very own neighborhood of Spring Creek Forrest. One of the very loveliest gardens, alas, has since declined since the original owner sold the house. At it's best it looked like the pictures of a classical English cottage garden in one of the glossy home-and-garden magazines. Admittedly it was high-maintenance, with stone and gravel pathways, a patch of lawn and flower borders to die for; that first owner had no social life at all, outside of work. She spent all her time on the garden, and it showed. 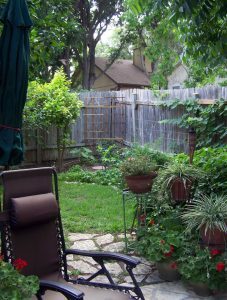 But the second spectacular garden that I know of has been established on an even tinier lot – and the best of it isn't even visible from the street. You'd never know, just by looking – although the fact that the front lawn and the single well-manicured flower bed in it would likely give a clue. The house is one of those very like mine; a narrow rectangular cottage built close to the property line on one side, with the garage at the front. 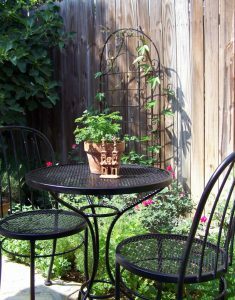 There is a gate into the long and skinny side yard, which leads to the front door – which isn't actually at the front, being that it is in the middle of the long side. A lot of the smaller houses in Spring Creek Forest were built like that, which means that at worst, the windows along that side offer a splendid view of the long blank wall of your next-door neighbor's house, at a distance of about fifteen feet or so. Not this house, though – a number of small ornamental trees planted by the original owner masked that unenticing prospect. The original owner also had a screened back porch installed at the back of the house – which was one of the main reasons that Bess and James bought the place as their retirement home about two years ago. 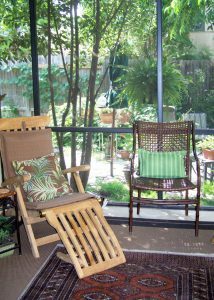 They loved the screened porch, and the tiny yard that it overlooked. The house had one more advantage; some very tall trees in neighboring yards provide shade in the afternoon; a good thing, especially at the height of summer. And because of the slight grade present, none of the neighboring houses windows overlook that patch of pocket paradise. 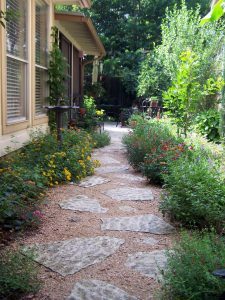 One of the first things that Bess and James did was to tear out a wooden deck and gazebo along the side, and replace it with a walkway of flagstones set into decomposed granite gravel. There are several benches and chairs along that skinny side garden; it feels larger than it really is. 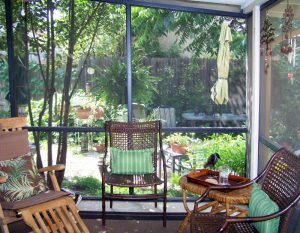 The screened porch looks out on the back yard, and another paved area, shaded with a fig tree. 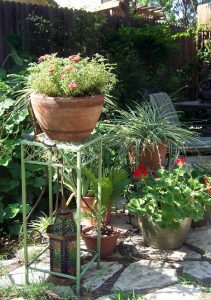 Bess has many flowering plants in pots lining the walkway. 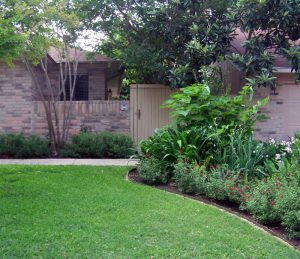 They do have hopes of a small patch of healthy lawn – but near-constant shade makes it iffy. And almost the best part is that nothing planted in it is particularly exotic or high-maintenance; in fact, Beth laughs, because just about all of it came from Lowe's.